Off with the corks! And your favorite wine bar is. . . ? Among them: Verve (Columbia City), Poco Wine Room (Capitol Hill), Smash (Wallingford), Olives (Edmonds) and Twisted Cork (at O/8 in Bellevue). This isn’t the first time I’ve discussed the subject. Back in April 2006 I reviewed Bricco (Queen Anne), Portalis (Ballard) and the Vintage Lounge (at Daniel’s Broiler in Bellevue). So, now I’m wondering: where do you go to lift a glass of grape juice? You had a big miss in your column on neighborhood wine bars – Swirl in Magnolia. Under new ownership since May – it has made a believer and regular wine bar customer out of me. In fact – our book club meets there every month on a Wednesday – when they have discounts on bottles. Their menu always has exactly what you need when you are there and it is lovingly prepared for you by the owner Annie Hoffman. Whether you are in the mood for the special popcorn – desert – or a steak sandwich – there is something there for you. Annie has shown herself to be a good citizen – helping many groups out with their fundraising events. Impromptu in Madison Park is wonderful and the staff is so helpful with the list. The food complements the wine and is well thought out and even better, tasty. Bonus: when it is warm out the outdoor tables are fantastic. How did Local Vine in Belltown miss the list? North City Bistro and Wine Bar in the North City region of Shoreline. A lovely wine bar, wine shop and bistro, with live music three nights a week. Small plates to enjoy with the wine, or full dinners as well. Larry makes his patrons comfortable and can make suitable recommendations that are right on the mark. SO glad that Verve was at the top of your list. I’ve enjoyed going there since its opening…a couple things you missed (I know you’ve limited space! ): Verve is run by a FABULOUS woman, who’s name I’m completely blanking on. I know that I always like to support woman-owned businesses! Secondly, Verve has an AMAZING deal for Tuesday nights, 6-8pm. $10 wine tasting–6 generous ‘tastes’–and the theme is always different. Argentinian wines, local wines, califorinia wines…its great. And what’s better is that she has someone different come in each week to do the tastings who is knowledgable on the region or theme. I’ve learned SO much about wine from all over the world–this place is a gem! Red House in Renton – fabu selection of wines, beers and a great menu of small plates and full entrees. I’m thrilled that you highlighted what’s been our favorite wine bar for more than a year: Verve in Columbia City. Chef Garrett Brown’s food elevates the place from wine bar to gourmet restaurant. His consistently innovative seasonal dishes never fail to delight. Thanks for sharing the good news! I love those blasted brussel sprouts, too! Second for North City Wine in Shoreline. You wouldn’t know it by the outside (horrid sign up top, off from the street, 175th, where you might miss it if you didn’t know about it), but this place is really nice inside. Casual but classy, a great spot for a good bite with some neat options by the glass as well as purchasing by the bottle (for there or home). Larry and Pat are so laid back and will help you feel so welcome, and really know their wines – not the run of the mill selection. Great northend choice for those who just like “good” wine (me), as well for the “cork-dork” (my hubby). Bricco at the top of Queen Anne. The wine selection is amazing, along with an extensive collection of imported cheeses and Salumi meats….heaven! How about Portalis in Ballard and Brix in Kirkland? These are two great winebars that are heads/shoulders above the Purple chains! We’re in love with Brix in Kirkland (the scallops, the upscale poutine, the burger…and the wine list ain’t bad, either :o) and Purple is always an old favorite, particularly since we live in Woodinville and nothing beats half price wine by the bottle on Sundays at the original W’ville location. 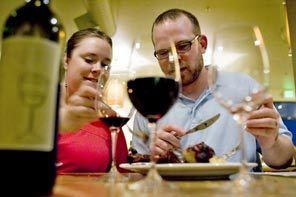 Try Sip in Issaquah, awesome wine and food! Stroll down 152nd St in Burien someday and you’ll find the wine bar that the neighbors crazy about – Vino Bello Wine Bar & Shoppe. Not only do they have a huge and very eclectic selection of wines by the glass, an awesome happy hour, wine tastings with live music on the weekend but many hard-to-find wines to-go as well. We never miss wine tastings there and the staff always knows our names. If you’re search for a “wine bar” must include a full restaurant kitchen I guess you should skip this place though because it’s a TRUE wine bar with very little in the way of ‘restaurant’ to get in the way. Small appetizers are paired with the wines which are good enough for us! Sorry you missed it. The Cheese Cellar, at Fisher Plaza in Seattle, does a weekly wine flight “taste” and a cheese & charcuterie platter, plus gelato & sandwiches. Methinks an owner or two that didn’t make the cut might be positing here today…eh Dawn? Good call on Verve! The quality and value combo there is off the chart. The Tuesday tastings and the no-corkage-fee-Wednesday combined with consistently outstanding main dishes like the chicken you mentioned, lamb shank, pork belly, etc, have made me a twice weekly (or more!) regular there for the last year. Our favorite (and not just because it’s close to where we live) is The Grape Adventure at 12930 SE Kent-Kangley Road in Kent 98030. It started out as just a wine bottle shop about 3 ½ years ago. It was a really good one, they did well with it, and they moved to a bigger spot a couple of doors down in the same shopping center. With that move, they also added a kitchen that serves really good small plates/tapas-type dishes. They were fortunate to get a former chef from the Meridian Valley Country Club to run the restaurant part of it, and she is a marvel. The food is excellent, there are hundreds of wines available (many by the glass), and they also have several taps of import and microbrew ales available. Scott and Katie Jones, the owners, are very personable and really know their wines. Portalis. Walk the Sunday Market and finish with a wine tasting. Great staff and now the not so secret of Ballard. A third for Brix in Kirkland. Stopped in after reading a review in your paper and I have come to really like the spot. There’s a good vibe from the customers. The wait staff is very knowledgeable about the wines. The mixed drinks are good as well and the food is mostly pretty yummy (I have had cravings for their Mac and Cheese with crab). Living in the South end, I find my way through the doors and into Vino Bello in Burien often. comfortable, relaxing, and knowlegable staff make this a favorite. Wow, I can rattle off a few. Harvest Vine in Madison Park. You should visit Village Wines in Woodinville. A great retail shop w/ 65% N.W. 6 new wines each week on tasting menue. Wine maker Friday nights and delicious small food plates. Truly a hoppin’ place with fun and educated owners and staff. Sip in Issaquah is the best! Half off bottles on Wednesday and there are rumors of a Seattle location soon. my friend is the assistant gm and former wine stewart at twisted cork! The Local Vine in Seattle definitely belongs on the list, particularly if the emphasis is on wine AND food, and it appears that it was missed twice. Twisted Cork in Bellevue doesn’t belong on any list, which is typical of the eastside, unless you have no taste (I see that you didn’t really praise the food, although you mentioned it). Village Wines in Woodinville has no kitchen so doesn’t really qualify. The main point, though, is that most of these places overcharge mightily for their glass pours! When are they going to figure out that they’re better off charging $6 and selling two glasses than charging $10 and selling only one?